Many foreign trademark owners come a cropper at the registration stage, although this is easily avoided. “When it comes to trademark registration, it is first to file - it is very simple,” explains Horace Lam, a Beijing-based partner at Jones Day. The ASEAN Economic Community: good news for trademark owners? Is there life for IP owners after Nokia and Philips? President Obama has placed the fight against counterfeit goods firmly on the administration’s political agenda, using his State of the Union address to outline plans for a trade enforcement unit. A series of online protests has stalled the progress of anticounterfeiting legislation in the United States, with public demonstrations in Europe threatening to have the same impact on the Anticounterfeiting Trade Agreement (ACTA) across the Atlantic. 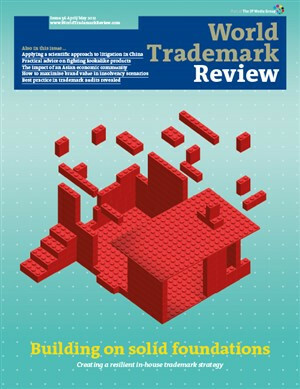 The generic top-level domain (gTLD) application window opened on January 12 2012, with the trademark community’s focus turning to the protection mechanisms at the second level. The Court of Justice of the European Union (ECJ) has held that the filling of cans that already bear a sign similar to a trademark does not constitute use of that sign in a way that can be prohibited by the trademark owner. For regular jurisdictional updates, see WTR Daily. Delivered straight to your inbox, WTR’s regular email news service provides legal updates, industry analysis and the editor’s pick of the best trademark content from around the globe.